Here’s a handy tip. If you are planning to break down on the M5 in the middle of an almighty rainstorm on a Bank Holiday Monday, try not to do it when there’s a vomiting pregnant lady in your passenger seat. It really takes the gloss off that winning feeling. Let me start at the beginning. It’s September 4th, 1993. An eight-year-old boy is in the top tier of the Warner Stand at Lord’s, peering through the gloom to make out the figure of Roger Twose spooning the ball over cover point. Minutes later Dermot Reeve lifts the NatWest trophy, sparking a lifelong obsession with Warwickshire County Cricket Club. Fast forward to August 2014. The little lad looks on as another piece of silverware, sponsored by that very same bank, is raised aloft by Varun Chopra on a soaking plastic podium in a soggy corner of a freezing Edgbaston. The time is approaching 10pm. The crowd have been waiting for this moment for more than 12 hours. For the little lad, it is more like 21 years. People talk about memories fading over time, growing blurred and out of focus. But back when my love for cricket was taking shape, long before HD TV, everything was happening in technicolour and surround-sound. I would pore over programmes, scorecards and autographs, absorbing every detail, feeling every crack of willow, every bead of sweat. In the 1993 semi-final, Reeve collided head-on with Somerset keeper Piran Holloway, leaving them both flat out on the square. I wasn’t there and I’m not sure I even watched it on TV, but I can still hear the ringing in my ears. The descent was quick and painful. Nick Knight dragged us through the turn of the century on willpower alone. In 2000, as we lost a rain-affected Lord’s final to Gloucestershire, we roared Donald on as he cupped his ears provocatively to the Edrich stand. It felt like the noise would make Old Father Time fall off his plinth. Watching it back on TV we could barely be heard. I lost interest as I moved away to become a student, frowning wearily at online scorecards as a succession of captains tried and failed to establish a new identity for the club. There were moments of light – Championships in 2004 and 2012, a one-day trophy in 2010 – but my passion was fading. I had discovered drama and girls and guitars and snakebite, and later work and trains and smart trousers. There was no room for cricket. I have never cared much for national identity. I don’t revel in England’s green and pleasant land, extol the virtues of a full English breakfast or grow misty-eyed at half-imagined memories of Shakespeare, Churchill or Princess Diana. I’m not familiar with the furthest branches of my family tree, and don’t have much desire to go digging for its roots. Since leaving Birmingham I have moved around a lot, every trip back to the Midlands just a smoggy reminder of awkward pubescence. I was almost embarrassed to call it my home. I will turn 30 in a few months, and now realise I have measured out more than two-thirds of my life through cricket. On Saturday morning I drove my wife and unborn child to Edgbaston and parked in the very same spot my dad used when he took me to my first Test Match in 1991. It was a thumping victory for West Indies over an England team featuring Ramprakash, Lewis, DeFreitas, Hick and Atherton. The programme is available on Ebay, but I don’t need it. It was all ingrained into my six-year-old head. I don’t remember much about what happened on Saturday evening. I watched most of the final through my fingers, squinting anxiously at the required run rate more often than the action itself. Flintoff hit two sixes and everyone around us went nuts. They saw the headlines. The journalist in me admitted what a story it would be. I sank in my seat. But he couldn’t finish it off, and then it was over. Fireworks exploded at the city end. We elbowed our way round to the blue spaceship where the crumbling old pavilion used to be. Back in the day we would run on to the pitch and look up as a sweat-drenched Reeve – he always looked exhausted, whatever his role in the match – celebrated another triumph. They don’t do balconies anymore. Now they do selfies. I got one with William Porterfield. I wanted to grab the trophy and run away. Instead I patted him on the shoulder and muttered “Well played”. This was about more than just another game of cricket. This was my childhood, my heritage, the little lad rediscovering a lost treasure. People love to disparage my home city, and there was a time when I would have joined in with them. Now I want to puff out my chest and defend its honour. Whatever name they attach to the team, it doesn’t matter. I want to wrap that bear and ragged staff in my arms and protect him from the world. You don’t have to be a trained psychologist to work out the hidden meaning. Witnessing your team winning a trophy as an eight-year-old is impressive. Not many people can claim to have done so at the age of minus six months. Here’s hoping it’s the first of many. Come on you Bears. On June 6 1994 I was sitting in the old members’ stand at Edgbaston, watching an innings which defied history and defined a generation. I was nine years old, and scarcely able to comprehend what was unfolding in front of me. 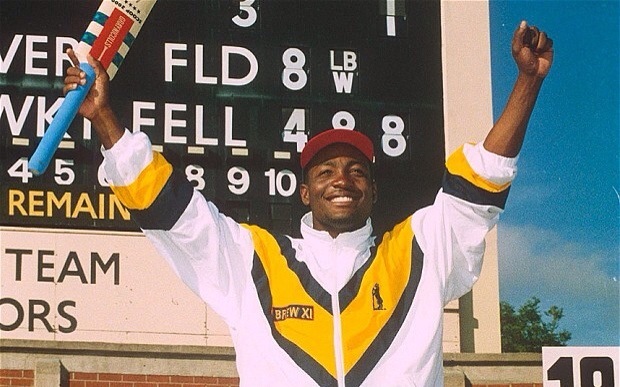 Warwickshire’s Brian Lara was racing through the 400s, on his way to the first class world record which may never be beaten. The moment he smashed the final ball of the match through the covers will be replayed and revisited for years to come. How wonderful for a young lad with a growing obsession with the game to witness such a historic moment. Unfortunately, I missed it. With Lara getting ever closer to the record, we had to leave because my younger sister had a piano lesson. I have never forgiven her. The iconic image shows an exhausted Lara, arms aloft and bloodshot eyes squinting into the sun, the city end tins in the background showing numbers that have never been seen before or since. 20 years later it seemed strangely fitting that my first victory of the season should finish with two teams exchanging sleepy handshakes in front of a broken scoreboard. 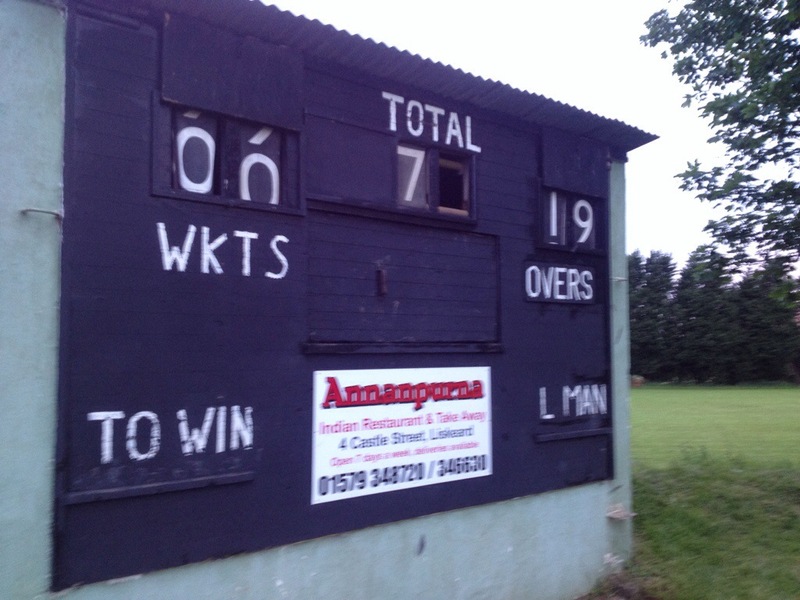 Menheniot-Looe had definitely won this T20 evening league fixture against Teachers at Liskeard, but nobody was quite sure how, or by how many. We batted first on an old fashioned sticky wicket. It was one of those surfaces where the bowler lets go of the ball and you have time for a cup of tea, a browse through the papers and a little snooze before selecting your shot. Our top order found it hard going, but thankfully Kieran’s unbeaten 30 – the maximum individual score in this format is some way off Lara’s 501 – helped us to a competitive score. I joined Kieran just before he retired and shared a couple more partnerships with James and Malcolm. I faced a spell from one of their bowlers which was unlike anything I have ever seen before. Dressed in a black jumper and cream chinos, he ambled up to the wicket, paused, put his weight on to the wrong leg and hurled the ball in the vague direction of the other end. When cricketers talk about someone ‘chucking’, they usually mean he’s got a slightly bent arm. This guy actually threw it like he was either attempting a run-out or trying to cause an injury. Safe to say, most of his balls missed the target; he bowled five wides in a row before I managed to reach one. But when someone like that turns up your priority as a batsman is to avoid the embarrassment of getting out. He was soon replaced with our own Zac, playing for the opposition as they were one man short. Having just got used to their gentle dobbers, Zac had that extra bit of pace and wasn’t offering any friendly looseners to his mates. He skidded one through to trap me LBW and then clean bowled our skipper Bill, leaping into the air in celebration. We wondered whether he knew which side he was on. Our bowlers were much stronger than theirs for the most part. Kiwi Phil, the club’s new overseas player who has already inflicted a few bruises in the nets, bowled off a short run but was still too quick for the Teachers batsmen. Third team stalwarts Charlotte, Tom and Helena pinned them down, and I creaked my way through a couple of overs without causing too much damage. It was strange playing 20 overs a side. I felt I didn’t have enough time to stop and think. This can be an advantage – I enjoyed pushing the fielders for quick singles when I was at the crease – but things moved very quickly in the field. I tried to help Bill out with his field placings, which looks easy on TV but is much harder when you can’t see the big picture. When I came on to bowl I stupidly didn’t measure my run up properly and tried to race through my action. I hope more experience will bring less haste.